Sunday April 2nd 1899 "Easter Sunday" It snowed some today. I was busy most of the forenoon with the work. I had dinner early and read and wrote in the afternoon. Monday April 3d 1899 It snowed all the forenoon. I worked on my mat After an early dinner Luther helped me wash and Will went to Hill Siding. The clothes got dry. Rob would have been 25 years old today if he had lived. Tuesday April 4th 1899 I got my dinner ready a little late as I washed out a few things after ironing. Luther had been up town with corn to grind. I made yeast and churned and set some hens in the afternoon. 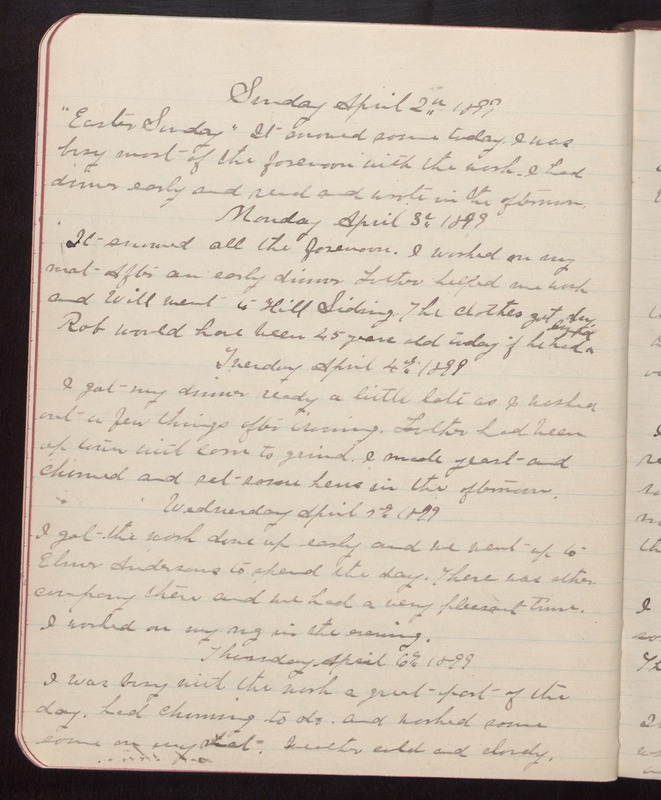 Wednesday April 5th 1899 I got the work done up early and we went up to Elmer Andersons to spend the day. There was other company there and we had a very pleasant time. I worked on my rug in the evening. Thursday April 6th 1899 I was busy with the work a great part of the day. had churning to do, and worked some some on my mat. Weather cold and cloudy.